Lorde curated the whole soundtrack. I was super excited to hear that coz i like Lorde but it’s actually quite disappointing. i think The Hunger Games Soundtrack is still my fave. JENNIFER LAWRENCE SINGS THE HANGING TREE AND IT IS AMAZING. 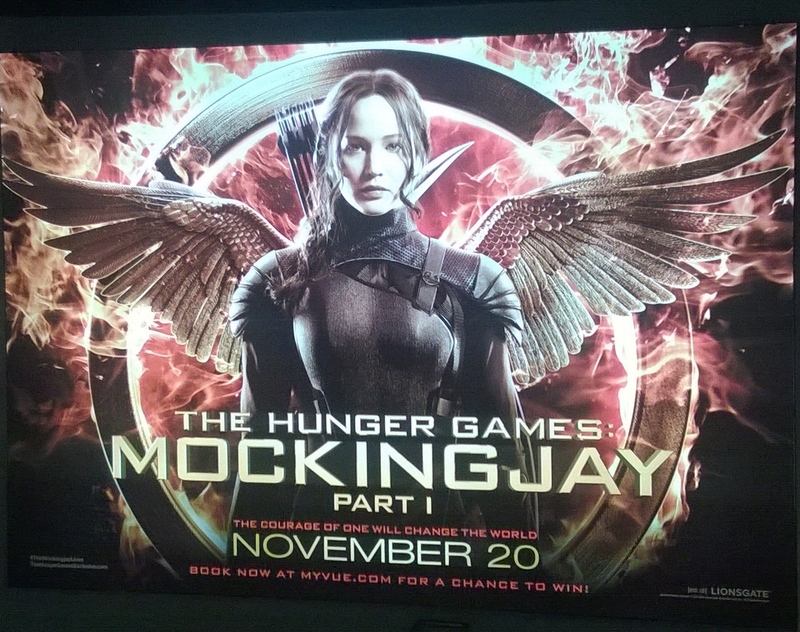 that is on the Mockingjay Part 1 score. 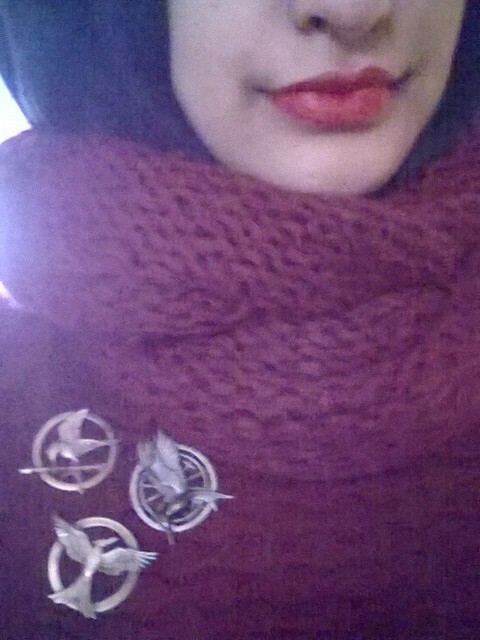 I WORE MY MOCKINGJAY PINS!!! FIRSTLY: THE FILM STAYS TRUE TOT HE BOOK. IT ENDS MIDWAY THROUGH CHAPTER 13 which isn’t even half way through the book…so i’m sure Mockingjay Part 2 is gonna be longer. basically i was constantly tearing up and my heart was just broken. this film is EMOTIONALLY DRAINING!!! i’m just so proud of KATNISS EVERDEEN…she is suffering from PTSD and Jennifer Lawrence’s performance is brilliant…everything from the pain, the way she plays with the pearl, the vacant look in her eyes, the propos and how she BECOMES the Mockingjay the look of defiance in her eyes and the strength she shows but then how weak she is because she has lost so much and doesn’t want to lose Peeta. AND WHEN THEY ARE RESCUING PEETA AND SHE SAYS ‘I CAN’T LOSE THEM BOTH’ urgh it killed me. it highlights the consequences of war and how after everything Katniss and Peeta DID NOT WANT TO BECOME WEAPONS OF THE CAPITOL and yet that is exactly what they are. Peeta is Snow’s weapon and Katniss becomes Coin’s weapon. the banter between Haymitch and Effie was so cute. FINNICK AND ANNIE’S REUNION WAS SO ADORABLE!!! it was brilliantly done because Peeta didn’t even say anything. he just attacks her and my heart shattered. the last last scene is Katniss waking up and going to find Peeta locked in a room SCREAMING AND GOING CRAZY coz he is tied to a bed and like HE HAS BEEN HIJACKED. but Peeta is in there somewhere…the soft, kind, gentle Peeta who loves Katniss. WHICH IS WHY PART 2 WILL BE THE DEATH OF ME BECAUSE OF ‘Real or Not Real‘ and Katniss telling Peeta about himself and who he is. pp.s i really wanna see it again…even tho it’s so painful!